timetables of trains and busses to C.K. 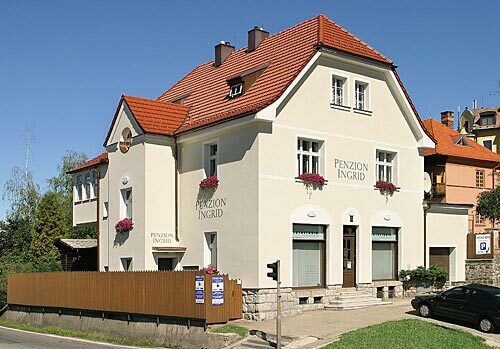 Pension INGRID Cesky Krumlov. Accommodation for you! + We can arrange a door-to-door transfer from or to various cities in the Czech rep., Austria and Germany (more info). PENSION INGRID offers comfortable accommodation in the historical center of Cesky Krumlov for reasonable prices. 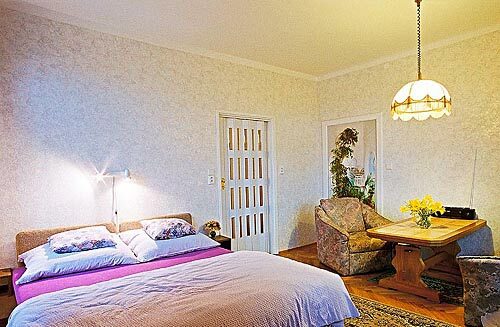 Accommodation is possible in doublerooms, triplerooms and appartments for up to 5 persons. Each room (apparment) has its own bathroom and toilet. 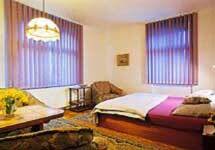 Pension INGRID is located in the historical part of Cesky Krumlov. The square is two minutes by foot (300m) from our pension. You can easily get to our pension by your car without any permit to drive in the city. Pension has its own parking place and garages, where your car can be left. See also how to get to our pension. 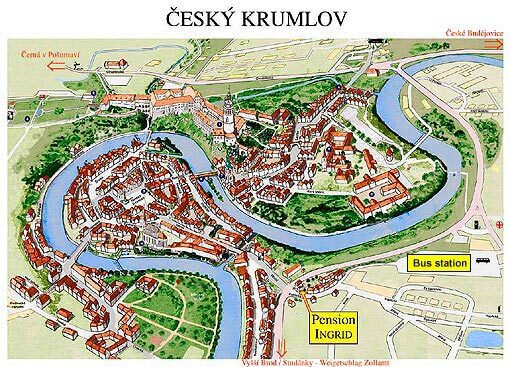 The bus station in Cesky Krumlov is 150m from Pension INGRID. Here you can find out how to find us. The train station is about 2km from our pension. However you can either take a taxi, or we can pick you up at the train station. Have a look at this page to see more information about buses and trains. Traveling with family or with you friends? If you want to stay close to your chlidren or your friends, our appartment is the best choice. It consists of two bedrooms and can accommodate up to 5 persons. 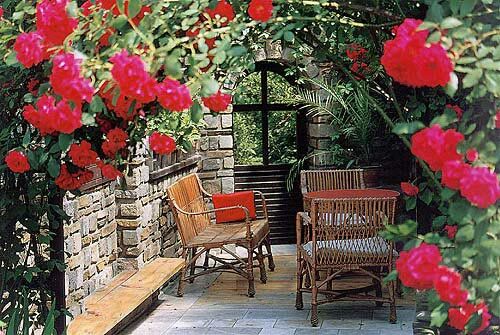 Pension offers delicious continental breakfasts, which you can enjoy during the summer in the garden pergola with a beautiful view of the castle. For your lunch and dinner, loads of restaurants are waiting for you all around. There is also a little supermarket, where you can buy groceries, right accros the street. Even though you may be in the foreign country, you can keep in touch with your family and friends thank to free internet connection for guests. You can search for useful information, your next journey direction or just chat on our PC with internet connection, which is available 24hrs a day free of charge. There is boat and bicycles rental, fitness and swimming pool near the pension. Shooting range and horse riding are located about 1km from pension. The Lipno Lake is about 20 minutes by car. 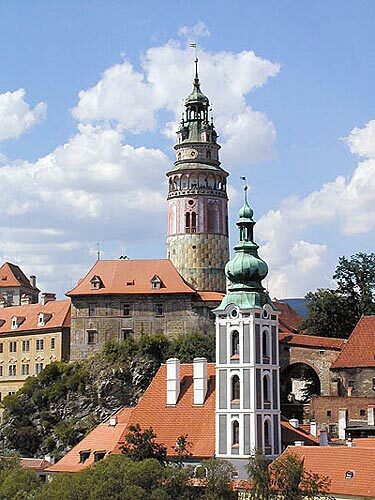 Krumlov castle is the pearl of South Bohemia. 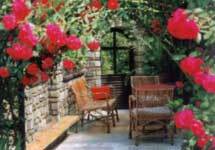 If you are planning a trip to Cesky Krumlov during the Celebrations of the Rose, do not hesitate to book your accommodation several months in advance. While finding accommodation in Cesky Krumlov in last moment, you may end up without any.